EXCELLENT BUSINESS PROPERTY IN PRIME LOCATION.....SITUATED BETWEEN TWO THRIVING RESTAURANTS ON THE WAY TO FORT MYERS BEACH.....HIGH FOOT TRAFFIC, BUS, TROLLEY.....FREE PARKING IN FRONT OF BUILDING.....NEWLY RENOVATED AND PAINTED.....2 SEPARATE ENTRANCES.....BIG STOREFRONT GLASS WINDOWS.....3 BATHROOMS.....CABLE AND INTERNET READY.....PLENTY OF WALL SPACE FOR INVENTORY DISPLAY.....GREAT LIGHTING.....ADDITIONAL 850 SF ATTACHED BUILDING WITH TWO BATHROOMS..2nd office is currently rented with nice income. 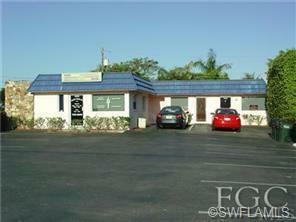 ******This office building SOLD over the past week. There were some concessions regarding a lease back. None would have been done without the help of Ms. Katheryn Young and Mr. Terry Schad Realtors with C-21 Tri- Power. It was a pleasure to work with you both! Thank you.